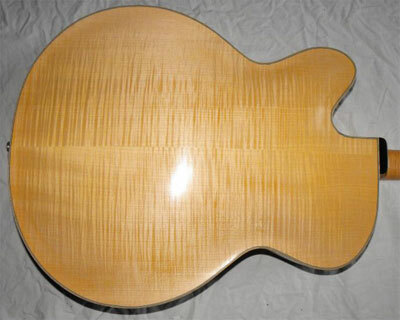 Hand carved Spruce top & Flamed Maple back & sides, make this archtop guitar a truly first class instrument. It has Ebony bridge, tail piece, fretboard & head veneer, with Mother of Pearl & Abalone 'Deco' styled inlays. Fitted with a Kent Armstrong 8k floating jazz pick up, mounted on the pick guard. The original Legend was designed for Big Jim Sullivan, who no doubt is still using it in his heavenly band. This guitar is the prototype built to test the sound & construction prior to a Black Walnut copy was built for a customer. 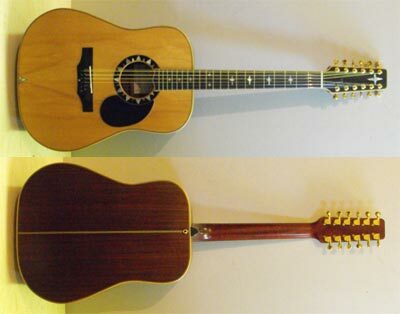 This fabulous sounding and rare guitar is likely to go quickly, so make your interest known ASAP. I don't want to let it go, but need to clear some space! The full Black Walnut version sold for £2k. 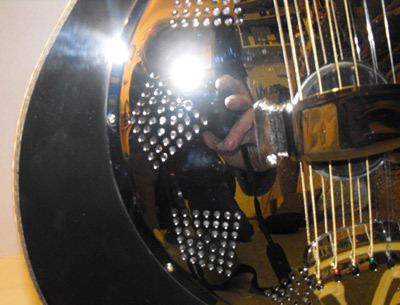 Conceived as a experiment of a 'lattice' system steel strung guitar. 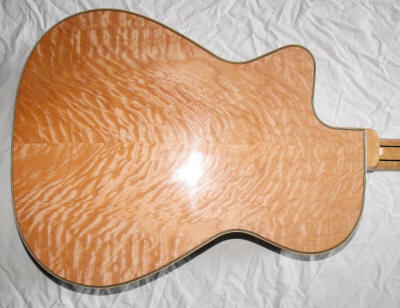 Using two thinner than usual European spruce tops with an asymmetric spruce lattice in-between them ( see inset photo of light inside guitar showing through). The only internal parts from a normal x-brace system are the bridge plate and under-fret-board cross-struts. American Walnut Back & Sides, bound with Curly Ash; Ebony fret-board & bridge, with chrome GoToh tuners. Walnut head veneer, rosette and Walnut neck. I don't have the written language to describe the sound, you are going to have to hear it. I had high hopes for this guitar & they have been exceeded!! Two tops seem to give twice the sustain, and a massive 'open' sound. £3,400 - SOLD - but let me know & I may make another. What's a 'luthier' doing with a banjo! So in the effort to clear space, I have to let this banjo go. It has a new goat skin head and I've set it up so it has a good playing action, so it plays well and sounds extremely good. 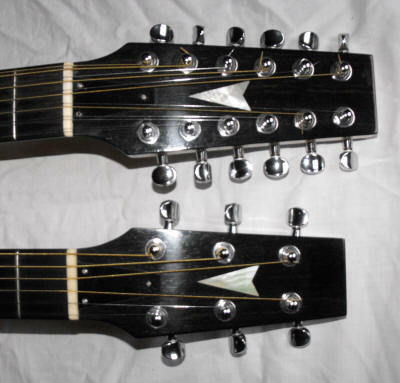 These are probably the best 12 strings ever built (as Carlsberg would say). The sustain lasts for ever. Indian Rosewood back & sides and spruce top give these 12 string guitars fantastic base and all the treble 'zing' you could want. (I don't supply ear-plugs when your trying this guitar - bring your own!!! Currently strung as a Baritone. 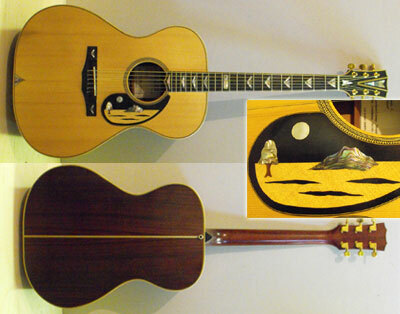 A guitar that demonstrate all the luthier's art - £3,500 o.n.o. 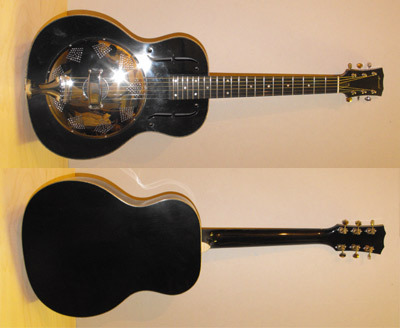 Handmade National style biscuit bridge 'Black Chrome' Resonator Guitar, Wooden bodied, with Black cellulose finish and beautiful flamed maple binding. Mahogany neck sprayed with black cellulose. Ebony head veneer and fret-board with 6mm mother of pearl dot inlays. ' 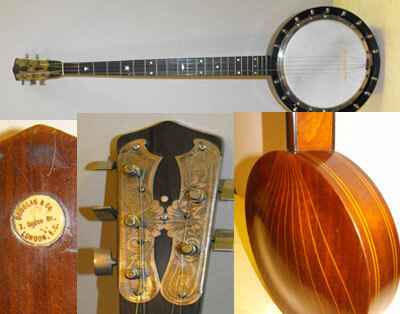 Butterbean' tuners & Bone nut..
'National'® resophonic cone, biscuit & saddle - giving a great tone. Action is set for compromise slide & finger styles. Great tone & GODDAM LOUD !! The Gemini 6/12 really speaks for itself! European Spruce top, braced to take the pull imposed by all that “wire”! Maple back, sides & necks, with Ebony bridge, board & head veneers. Fitted Headway pick ups, with selector switch (not both together) with centre position being totally OFF! Fantastic sound on BOTH the 6 & the 12 string sides. I made this for myself and as a demonstration instrument, but would sell for £1975 – with case ! A superb instrument with Ziricote ( Mexico ) back and sides, American Curly Ash binding . 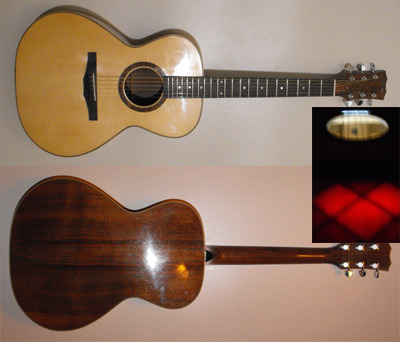 European Spruce top with scalloped spruce x brace and mahogany cross strut under fretboard end for extra stability. !!! Sale price 1999 !!! Another superb instrument Commissioned by High End Guitars. Black Walnut back and sides Western Red Cedar top with scalloped spruce x brace and mahogany cross strut under fretboard end for better stability Mahogany back braces and linings. A superb instrument. Flamed French Walnut back and sides with American Curly Ash bindings. 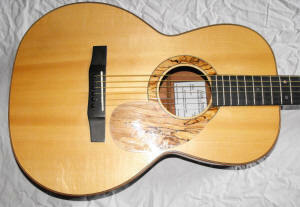 European Spruce top with scalloped spruce x brace and mahogany cross strut under fretboard end for better stability. 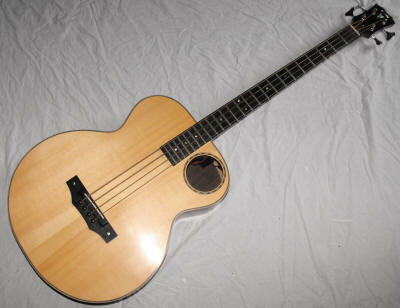 This Phaedra has Tasmanian Blackwood back & sides, with a European Spruce top. Ebony fretboard, bridge & bindings. The rosette & head veneer are Black Walnut. Abalone inlays finish off this beautiful guitar. 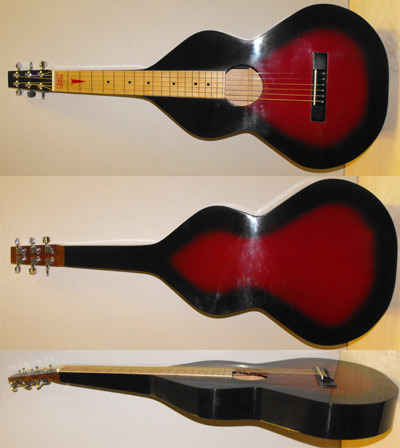 The AC was conceived to work as an acoustic bass without having to plug in to get anything worthwhile out of them: as is the case with so many acoustic basses. The bracing design is very different, and it's this that's made the AB sound so good ! The AGE electric guitar is a demonstrator/prototype of a new range, planned to be coming out next year. 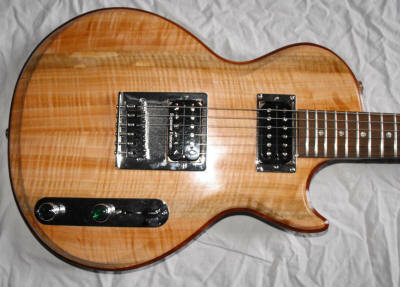 Solid Maple body with Mahogany centre splice, underneath a Flamed Eucalyptus drop top. This Phoenix has a Sitka Spruce top with fabulous Quilted Maple back, sides, neck, head veneer & fretboard. The bridge is Ebony & the rosette is 300 year old Burl Elm ( it came off of an old beam). Fitted with a Headway under saddle pick up. Those of you who are familiar with Headway pick ups, will know how good they are! Plays, sounds & looks truly fantastic ! Must really be seen in the flesh, to be really appreciated. 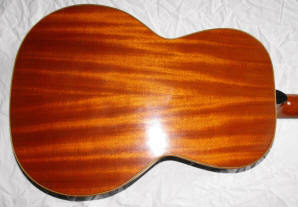 European Spruce top. 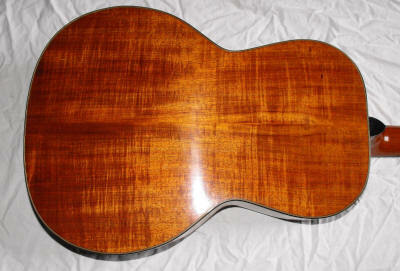 Brazilian mahogany back, sides & neck. Ebony fretboard & bridge. 630 mm scale.